Britain has a problem: It wants fewer immigrants, but its economy desperately needs more. The British government is seeking to slash the number of immigrants from the European Union following its departure from the bloc in March 2019. It's planning tougher controls despite warnings that more EU workers are needed to harvest the country's crops, build homes for its citizens and build its next startup. The risks are especially pronounced in health care. The National Health Service says there are over 11,000 open nursing jobs in England, and another 6,000 vacant positions across Scotland, Wales and Northern Ireland. The overburdened system, described by the British Red Cross as facing a "humanitarian crisis," already relies on 33,000 nurses from the EU. "We would describe the NHS as being at the tipping point. There are huge staffing problems," said Josie Irwin, head of employment at the Royal College of Nursing. "Brexit makes the situation worse." Jason Filinras, a 29-year old from Greece, was recruited last year to work as a front line nurse at a hospital just north of London. Filinras joined the hospital's acute admissions unit, where he runs tests and determines how to treat patients after they have been stabilized in the emergency room. "If you have a patient who is not able to take care of themselves, you have to do all the basic things for them -- from helping them with washes, helping them with toilet, feeding them," he said. He is just one of 250 nurses recruited from the EU by the West Hertfordshire Hospitals Trust over the past two years to work in its three hospitals. EU citizens now make up 22% of its nursing staff. The trust didn't have a choice. 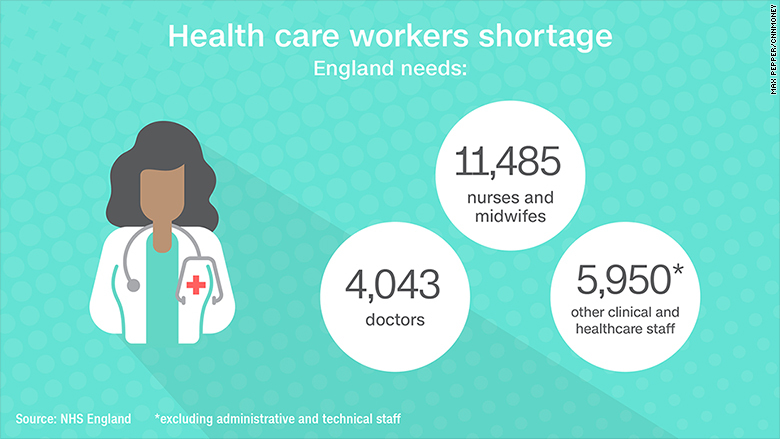 The unemployment rate is at its lowest level in four decades, and there simply aren't enough British nurses. The shortage of workers cuts across sectors -- from agriculture to education -- and across skill levels. There aren't enough fruit pickers and there aren't enough doctors. The political impetus to reduce immigration from the EU can be traced to 2004, when Britain opened its borders to workers from eight eastern European countries that had joined the bloc. Government officials expected 5,000 to 13,000 people from the countries to come to Britain each year. Instead, 177,000 came in just the first year. Critics say that increased immigration has changed the fabric of local communities, and undercut the wages of British workers. It's an argument that has currency with voters. Immigration was the most important issue for voters ahead of the Brexit referendum in June 2016, according to an Ipsos Mori poll. Theresa May, who became prime minister in the wake of the EU referendum, has promised to bring annual net migration below 100,000. The figure was 248,000 in 2016. It had been difficult to meet the target because EU rules allow citizens to move freely around the bloc. May says that Brexit will mean an end to free movement. "The government is putting politics above economics, which is quite a dangerous game," said Heather Rolfe, a researcher at the National Institute of Economic and Social Research. 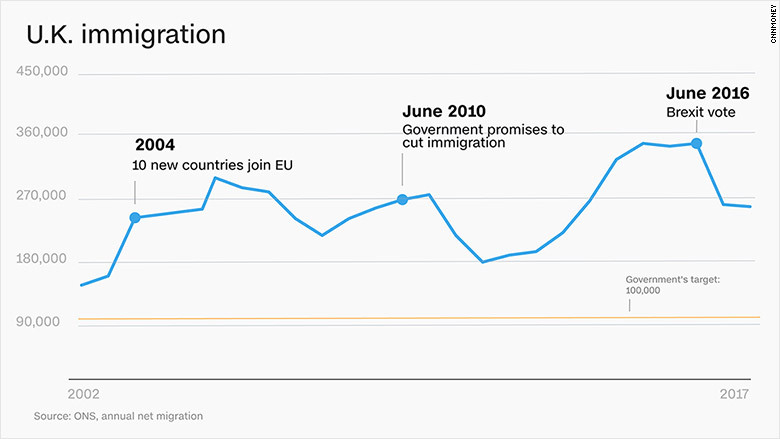 Labor economists say that a radical decline in immigration would hurt the British economy. The Office for Budget Responsibility, the government's fiscal watchdog, said that 80,000 fewer immigrants a year would reduce annual economic growth by 0.2 percentage points. "To lose these people would be pretty tough and it would mean that some sectors might find it very difficult to survive," said Christian Dustmann, professor of economics at University College London. Some EU workers, upset over political rhetoric and a lack of clarity about their legal status, are already leaving Britain. Net migration from the EU fell to 133,000 last year from 184,000 in 2015, according to the Office for National Statistics. The impact is already being felt: The Nursing and Midwifery Council said that roughly 6,400 EU nurses registered to work in the U.K. in the year ended March, a 32% drop from the previous year. Another 3,000 EU nurses stopped working in the U.K.
"It's all this uncertainty that will make us leave," said Filintras. "I can't say that I am 100% sure that I won't think about leaving." If he does move home, he will be hard to replace. Irwin said the British government has made it less attractive for new British nurses to enter the profession by scrapping college scholarship programs and capping salaries. Applications for nursing courses are down 20% as a result. Nurses make an average of £26,000 ($34,600), while German supermarket chain Aldi offers college graduates a £44,000 ($58,500) starting salary and a flashy company car. Trouble also looms in other sectors. A third of permanent workers supplying Britain with food are from the EU, according to the Food and Drink Federation. The British Hospitality Association, which represents 46,000 hotels, restaurants and clubs, has warned that the sector faces a shortfall of 60,000 workers a year if the number of EU workers is sharply curtailed. 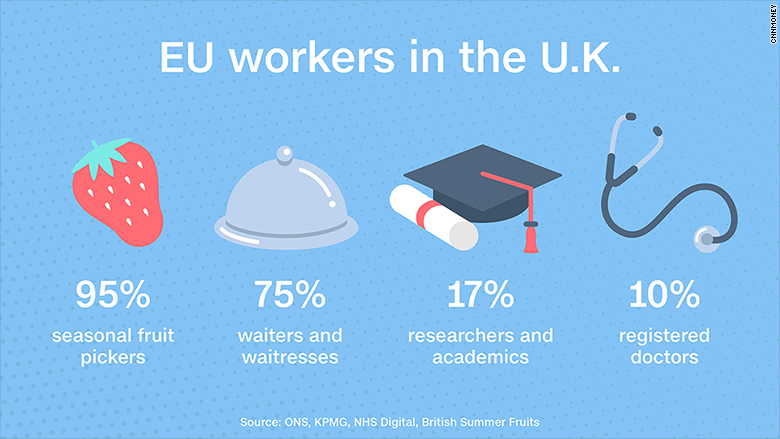 KPMG estimates that 75% of waiters and waitresses and 37% of housekeeping staff in Britain are from the EU. British farms are heavily dependent on seasonal workers from the bloc. "If you cannot harvest your strawberries anymore ... then supermarkets might buy the strawberries directly from Poland," said Dustmann. Business groups and labor unions have repeatedly called on the government to moderate its negotiating position. But May has shown no signs of backing down. "The government is interpreting the vote to leave the EU as a vote against immigration ... and to some extent that is true," said Rolfe. Boston, a town on the east coast of England, shows why: According to census data, the town's foreign-born population grew by 467% in the decade to 2011. In 2016, the town had the highest proportion of voters choosing to leave the EU.